I consider it a real honor when a business trusts Tall Pink Gumboots to take them through a rebrand. Rebranding can be tricky but as a company changes and grows – it needs to evolve with it’s target market and an ever changing world. The term ‘rebrand’ can encompass not only a change in the overall look and feel, but also a differentiation its value proposition and core offerings. 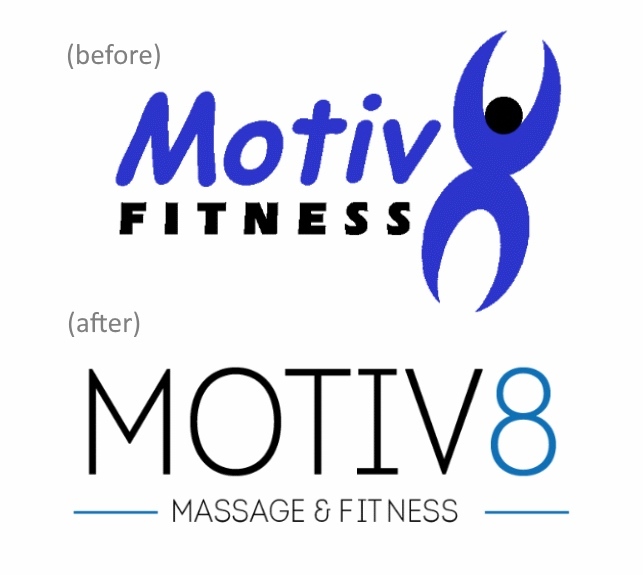 For Motiv8, their services had expanded to offer massage as a core service, so we wanted to work this into the logo. The thinking for the new logo was minimal, elegant and a unisex design. What we, and the client loved was that the end result was so simple, yet attractive. I worked closely with the talented young designer Rayne Geddes on creating the new Motiv8 Massage and Fitness logo. You can check out Rayne’s portfolio here.